Hi, and welcome to JT Hughes, Hyundai here in Shrewsbury. My name's Rob. I'm just going to take you around our demonstrator Hyundai Kona 1-litre turbo petrol. This is the SE model. As you can see, it looks absolutely stunning in the tangerine comet paintwork. Now, this car has done just under 800 miles at the moment, but it's a current demonstrator. So, it comes with your LED lights, daytime running lights, your alloy wheels, body-coloured mirrors and door handles. Around the back you've got your parking sensors and camera. Let's start by having a look inside the good-sized boot. 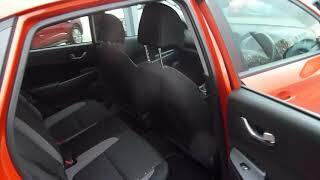 As you can see, flat load area, 60/40 split rear seats for any larger items, courtesy light up in the corner there. Under the boot floor there you've got some additional storage, and then underneath that tray, you've got your space saver spare wheel. Now, the 1-litre turbo petrol engine, 120 brake horsepower, so a good performance, very good economy as well. In the back, as you can see, loads of leg and headroom, very roomy indeed. Three full seat belts across the back, and we've got ISOFIX fittings on the two outer seats. And we also have electric windows in the rear. And if we move into the front again, the front seats are nicely shaped and supportive with height adjustable driver's seat together with electric lumbar support. You've got your centre armrest there with some storage inside, a couple of cup holders, six-speed manual gearbox, USB, auxiliary input. A couple of power sockets, air conditioning, your digital radio, reversing camera. And it also has Apple CarPlay, Android Auto. And then on and around your steering wheel, you've got your cruise control speed limiter, your trip computer buttons, audio controls, Bluetooth for your phone, auto lights, all standard, as is lane departure, lane assist, and traction stability control. And in the driver's armrest you've got controls for the electric windows and the electric mirrors. So there we have it. Our current demonstrator Hyundai Kona 1-litre turbo petrol SE model. If you'd like to arrange a test drive, then please contact JT Hughes, Hyundai, Shrewsbury on 01743-450 888.